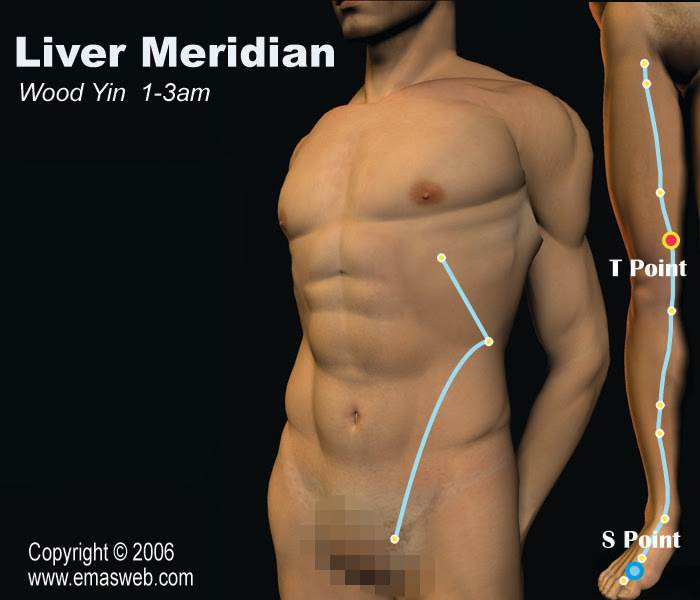 The Liver Meridian connects with the Gallbladder Meridian, with which it is externally-internally related. The main functions of the Liver are to store blood and to course and drain. It has the physiological functions of storing, secreting, detoxifying, defense, hematopoiesis and synthesizing necessary substances, such as sugars, fats, proteins, hormones, vitamins and so on. It is the center of biochemical reactions in the body. Symptoms of the Liver Meridian include lumbar pain, chest fullness, hiccough, enuresis, difficult urination, hernia (shan qi), fullness of the lesser abdomen, etc. The Liver Meridian opens into the eyes. One can often detect a person whose Liver Channel is abnormal when the whites of the eyes look yellow. Abnormalities of the Liver Meridian cause fatigue which does not improve even after sufficient rest. Long lasting abnormality of the Liver may cause rough skin and lack of elasticity, as well as freckles or spots. In these cases, the treatment should be focused on regulating and nourishing the Liver Meridian. Peak qi and blood flow in the Liver Channel is from 1:00 am to 3:00 am. 1. Dysfunction of the uro-genital system. 2. Dysfunction of the nervous system. 3. Dysfunction of the liver and gallbladder. 4. Dysfunction of the eyes. 5. Dysfunction along the course of the Liver Meridian.